Hey guys! 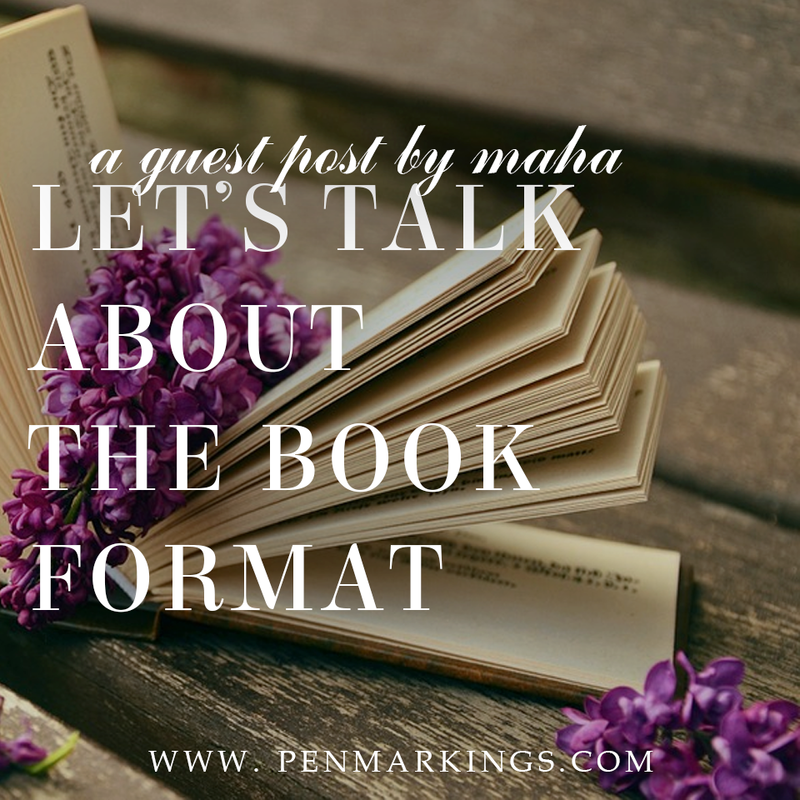 We’ve got the lovely Maha from Younicorn Reads gracing my blog with her presence today! She’s got a great post ready for us, and there’s plenty more of that at her blog here! Pop on over there and give her some love! I feel like there have been recently a lot of talk about what format of the book is the best. There have been these questions on Instagram/polls on Twitter for Hardcover VS Paperback (VS ebooks sometimes). So I told myself: Well, this is an idea for a post. It seems like 45% of the people who voted usually get their books in paperback, which means paperback wins! So now to the real talk. Here’s what I’m going to do. I’m going to make a pros and cons for each format (paperback, hardcover, and ebook) for you to choose which one is the best for you, then share my personal opinion. Pros: Paperbacks are light. Because, let’s be real, light books are amazing. You don’t struggle a lot with it. And paperbacks are cheap. SO CHEAP. Usually people who don’t have a lot of money get a paperback, especially if they like physical copies. Cons: Paperbacks are easily damageable, we all know that. So we, people who buy paperbacks, are very careful with our books. We don’t want a cousin to come and play with it. Seriously if this happens Mr/Miss Cousin will be in serious trouble. Pros: Hardcovers are in a really good quality. It’s usually difficult for them to get damaged. So if Mr/Miss Cousin plays with it, the book will be safe. He/She will get in trouble anyway, though. Hardcovers are also BEAUTIFUL. Have you ever saw a hardcovers bookshelf? Well, if you let me tell you, it’s BEAUTIFUL. Cons: Let’s admit it: hardcovers are heavy. I’m struggling to carry them sometimes. And hardcovers are also expensive. Sometimes they’re double the price of a paperback. WHY ARE YOU MAKING LIFE SO HARD? Pros: As you may know, we don’t always find the book we want in the bookstore. But ebooks are easily affordable, you click that download button and MAGIC! You can read the book. And with ebooks you can read on your phone or tablet, so it won’t take space on your bag (maybe it will take space on your phone though). And HOW ON EARTH CAN YOU DAMAGE AN EBOOK? Cons: Let’s be serious, staying in front of a screen for hours can damage your eyes. So reading can make your eyes in danger. And also, this may be my personal opinion but, am I the only one who isn’t comfortable with ebooks? I don’t know how to describe it, but I’m more comfortable with physical copies than digital ones. I personally get myself paperbacks most of the time, because hardcovers are expensive for me. But I sometimes get myself a hardcover if I have enough money. nless it’s for ARCs, and I usually avoid them because (as I said before) I’m not comfortable with them. But, real question: does the format of the book matter more than the actual content of it? Like, sometimes people (sometimes even me) ask themselves: In which format should I get the book? before asking themselves: Is the book good? I know you care about the beautiful-ness of your books and how it will look on your shelves, but sometimes it becomes over-caring. What really matters is the actual book, what story lives between its pages, what does it tell you. How do you read a book does not matter more than what you’re reading about. That’s why I invite you to seriously stop making a fuss about the format of the book, and care more about the content. What about you? In which format do you get your books? Do you think the format of the book is really important?